If you were to apply an outcomes lens to the effort to diversify philanthropy over the last four years, you would likely be disappointed in the small advances made in the proportions of philanthropic positions held by people of color and women. In one of a number of sessions on the topic at this year’s annual Council on Foundations conference, the word “flatlined” was used repeatedly to discuss the meager progress that has been made since 2011 in terms of race and gender representation among staff and boards of philanthropic institutions. This leaves many advocates disappointed. Bob Ross, the President of the California Endowment, for instance, confessed that his foundation had resisted the AB 624 legislation when it was proposed in 2008 that would have mandated California foundations to report on their grantmaking, staffing, and trustees using a racial and ethnic lens. Looking back at the results, he now thinks he might have taken a different position, at least as an individual leader. His opposition to the measure then was based on a belief that voluntary engagement around advancing an equity agenda among foundations was a better road than a mandate. But in fact, neither the numbers in terms of diversity of staffing and governance nor the dynamics of this landscape has changed much since 2008. The pipeline is still not working to move people of color into philanthropy, or to move women and people of color up in hierarchies, as quickly as white men. Larger national foundations are still doing better, as they were in 2008, in terms of the diversity of their staffs and boards than smaller and more local philanthropies. At the governance level, just 16 percent of foundation board members are considered racial and ethnic minorities. At the staff level, just 24 percent of full-time grantmaker employees are members of racial and ethnic minorities. But the employment landscape is but the tip of the iceberg; under the surface lies an attached problem in the lack of shared assumptions about the choice of frames within which to interpret entrenched social problems that affect marginalized communities more acutely than others. Lack of racial, ethnic, and gender diversity in philanthropy enlarges the understanding gap between philanthropy and the communities meant to be final beneficiaries. And assumptive errors that flow from a vastly different experience of the world, as one panelist said in another workshop, are worsened by the philanthropists’ own positions of power in the grantee/grantor relationship. This issues of identity separation creates a built in lack of voice for marginalized communities vis-à-vis philanthropy. In 2008, Rick Cohen wrote, “Across the sector, diversity and inclusion are mom-and-apple-pie concepts. And for marginalized or disenfranchised communities, this reflects a need for political power, which requires authentically constituent-led, constituent-governed organizations.” So the frustration expressed in the sessions at the COF conference is unsurprising. Philanthropy is still relatively stuck in a traditional charity dynamic. We can assume that this affects access to grants by groups that truly represent marginalized communities, but we really don’t know. 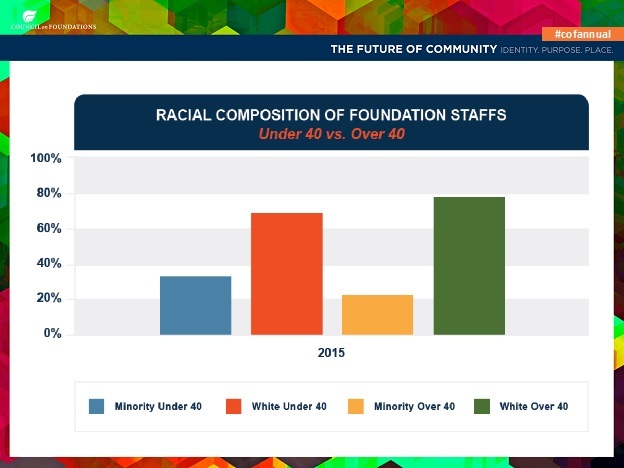 Foundations surveyed by the Council were largely unable, for instance, to estimate how many groups led by people of color they funded. Only 20 percent even thought they might be able to estimate that number—perhaps, the most shocking thing I heard. This speaks to a lack of attention that is almost incomprehensible in light of what we know about the full slate of race and gender-based inequity that pervades nearly every major institution in the U.S. But if you were to consider outputs instead of outcomes, the number of packed sessions at the conference aimed at getting people involved in conversation on the topic, you might be impressed. The discussions that were had ranged widely. from discussion of research findings on staff and board to the process required to make an institutional choice to bring an equity lens to all of its grantmaking. Ross says that the conversations being had need to remain at least partially convened around the research where measurable outcomes can be tracked. However, there also needs to be far more work around intentionally engaging trustees to understand how racial equity and other issues flowing from marginalization should be used as an increasingly active and primary lens. This was reiterated again and again: An equity lens needs to be claimed by the board for institutions to progress on all the levels needed. We repeatedly heard that although little progress had been made in terms of outcomes, an infrastructure was emerging to help change happen. Part of that is in a research effort that spans major infrastructure groups, but various panelists also spoke to the usefulness of the networks working on philanthropic equity, diversity, and inclusion (EDI) right now. These help members to think through what they’d need to do within their own institutions to leverage change. How will it make us look? Will I be able to engage in this conversation in a way that is appropriate? That anxiety is unproductive and blocks progress, she says, and needs to be shifted to excitement. Asking the questions is in and of itself a dynamic exercise, she observed, because the definitions of identity are so much in flux. Still there may be some hope in the representation of women and people of color among philanthropic staff members under 40, where the stats match more closely with those of the country as a whole. 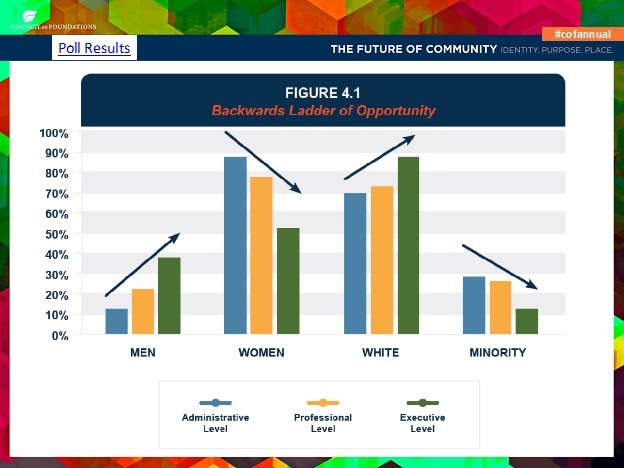 “Diversity in Philanthropy: The State of Change,” slide 17, Barnett. …but as Barnett says, we will have to work hard for that to progress as it should. Yanique Redwood, the president and CEO of the Consumer Health Foundation in D.C., said on one panel that her advocacy of a racial equity lens led her philanthropic peers to comment that she may need to dial it down a bit so as not to drive away others with her insistence on a different, race-informed social frame on health. But colleagues in the local regional association of grantmakers and within her own institution supported her advocacy. This speaks to that infrastructure development talked about earlier and the building of effort that’s very much in progress. The Council promises a forthcoming report in which much of their recent research will be further explicated, and we will keep you informed.